THE YEAR BEGINS: New Years Day on Nassau Street was cold but bright. 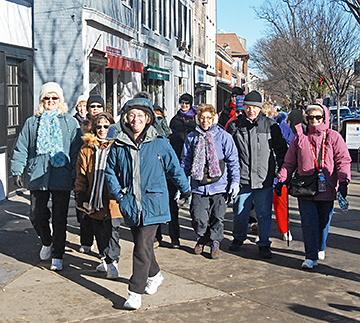 Princeton Area walkers enjoying their first walk of the year are joined here by Liberty Bell Walkers from Pennsylvania. The Township Committee elected Bernie Miller and Chad Goerner as Township Mayor and Deputy Mayor at its reorganization meeting Sunday in the Township municipal building. Borough Councils annual reorganization meeting last Sunday featured the swearing in of Council members David Goldfarb and Barbara Trelstad for additional three-year terms, the election of Andrew Koontz as Council President, and the Mayors annual address. Although he was once an enthusiastic believer in Princetons status as a happy valley blessed with a world-class university and thriving corporate culture that made it largely impervious to the vicissitudes of the outside world, Palmer Square Management Vice President David Newton recently had to acknowledge that the area has suffered as a result of the nations economic downturn. Describing the short films he presented at the Arts Council’s ninth annual Comedy Cavalcade as “beautiful little gems,” film historian Bruce Lawton screened six comic shorts from the early part of last century, showcasing the antics of film icons like Charlie Chaplin, Laurel and Hardy, Buster Keaton, and others. His selections garnered much approval at the packed house at the Solley Theater on Saturday. A resident of Princeton for the past 28 years, Peter Crowley has spent almost four decades in the banking industry, including stints at Citibank, Bank of America, and the Bank of Princeton. He described his recent appointment as president and CEO of the Princeton Regional Chamber of Commerce as fitting perfectly with his background. Monday was his first day on the job. Board members of the Princeton Free Wheelers cycling club met on Monday night in Borough Hall to discuss the clubs yearly events. They brainstormed sponsorship ideas; reviewed the annual club events; discussed ways in which to promote helmet wearing and bike safety; decided that members should vote for their favorite cycling rest stop, or bike-friendly establishment; and exchanged ideas about a keynote speaker for the monthly membership meeting in March. It wouldve been understandable if Dan Mavraides had felt jitters as he stepped to the foul line for the Princeton University mens basketball team with 1:07 left in the second half last Saturday against UNC-Greensboro. For the Princeton University womens hockey team, its annual foray to Harvard and Dartmouth has typically proven to be mostly fruitless. Last winter, the Princeton High boys basketball team traveled to Allentown, Pa. for the William Allen Holiday Tournament and came away with two losses.